Marc Tessier-Lavigne, president of The Rockefeller University, today announced a leadership gift of $100 million from The Marie-Josée and Henry R. Kravis Foundation to help create a new laboratory building that will be the centerpiece of the University’s major planned campus extension. The Marie-Josée and Henry R. Kravis Research Building, two stories high, will be constructed over the FDR Drive, spanning approximately three city blocks following the shoreline of the East River. Overall, the campus extension project will be four city blocks in length and will add two acres to the University’s current 14-acre footprint. Designed by Rafael Viñoly Architects, the innovative Kravis Research Building will house state-of-the-art laboratory space for Rockefeller’s scientific and educational programs. Unique features of the design include an open plan that will provide a high degree of flexibility to accommodate the changing needs of research over time. The Marie-Josée and Henry R. Kravis Research Building will be the foundational element of the University’s new Stavros Niarchos Foundation–David Rockefeller River Campus. The Niarchos Foundation–Rockefeller River Campus project was launched in November 2014 by two leadership pledges totaling $150 million—$75 million each from the Stavros Niarchos Foundation and from David Rockefeller. The Stavros Niarchos Foundation–David Rockefeller River Campus will house several new buildings in addition to the Kravis Research Building, including a dining commons, an academic center, and a conference center. 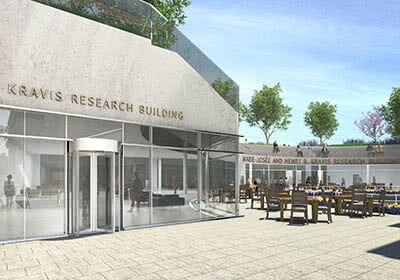 Associated gardens and other amenities will further enrich the University’s highly collaborative research environment. As part of the project, the University will also improve and beautify the public esplanade adjacent to the campus for the benefit of the greater New York City community, and make major repairs to the seawall along the East River. Video overviews of the Kravis Research Building and the Stavros Niarchos Foundation–David Rockefeller River Campus, along with architectural renderings, can be viewed at: rivercampus.rockefeller.edu.